Compatible with MIL-D1/DS and CMD Metal Detectors. Plugs directly to the GSMD Headphone Connector. Powered by the GSMD, no external battery required. No consumption when GSMD is turned off. 72-channel GPS /GLONASS/Beidou high sensitivity receiver. Up to 30 h data recording. Status indication by multi-color LED. High speed data download to a PC. Data integrity is assured by certification. 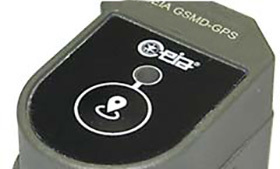 GSMD-GPS is a high performance compact accessory of compatible CEIA GSMDs designed to receive and record GPS data. The device allows the operator to record the Metal Detector response and the GPS information (Date, Time, Latitude, Longitude) in real time during the search operations. In addition, the module allows the operator to mark significant points. Data are stored into a non-volatile memory at a rate of one event per second. A connecting cable and a software utility are provided for downloading the memory content to a PC. Data are saved in .kml format (Google Earth compatible) and in .csv format.